My name is Helmut Schmidt, and I am facility manager for our mechanical components manufacturing sites in Germany. Let me explain: recently in my company, we started a new project for a 3rd manufacturing site (5500m²), including on one side production of machine tools and on the other side office area. 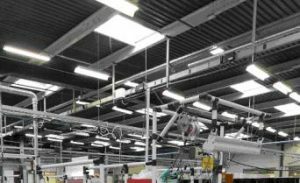 In the past, when we built our first 2 manufacturing sites projects, the contractors used cables on cable trays for lighting and power distribution. Now, for this 3rd project, we received quotations from the usual electrical contractors, with lighting and power distribution done the same way, with cables on cable trays. But also, as suggested by a design office, another quotation based on busway solution, quoted by another electrical contactor recommended by this Design Office. Finally, due to the quicker installation, the completed installation is quoted at same price, even though the busway products to purchase seem to be more expensive by 10% in my case. I was very surprised, so I looked for other examples available, and I found an example on the web, showing a busway installation 14% less expensive than standard solution, on the whole installation!! Until today, I didn’t make a decision yet to choose the contractor suggesting busway, because I feel a bit confused: it seems too good to be true … or are contractors really cheaters? In fact, I have trouble to understand why electrical contractors would not offer a solution bringing a lot of advantages to their customers, easier to install for him, and less costly overall. I must be mistaken somewhere. My analysis on Cons & Pros of busways is most probably incomplete … i really need your help to understand! In my particular project, as suggested by my design office, would you advise me to use busway rather than cable? If not, why? … and more globally, what are the main reasons why electrical contractors do not propose this type of busway solutions more often? or copy this trackback: http://engineering.electrical-equipment.org/electrical-distribution/contractors-are-all-cheaters.html/trackback from your own site. I’m pro busbar buth not always. At first you need to check the quality of the busbar because it still must be working in 2032, 2042…. If there is a fault on a busbar (water leak) than the hole installation is out of order. When are you pro busbar or when are you not ? This is today my concern! I presume you mean Busbar, not busway. I am a free lance electrical designer, the use of busbar is nothing new. its been used in such applications for at least 25 years and a lot longer in some forms (40 years +). I would suggest that if you are getting options for cable and busbar then you are not taking on board a building services design consultant to carry out a full design. By a full design I mean full and not design and build. To be frank you get what you pay for, do something on the cheap and cheap is what you will get. There may be instances where cable is cheaper than busbar and others where busbar is cheaper. The type, manufacturer and rating will also have a bearing on it. value engineering exercises will probably further cheapen the job and not necessarily give you better value for money. Don’t blame the contractor they are just earning a living like every one else. Get the job designed and specified right in the first place. In other words take on board a reputable consultant (most are) and whilst it will cost you a little more now it will pay dividends in the future. 1/ I hear sometimes “busway” and sometimes “busbar trunking”. Usually I reserve “busbar” to busbar in switchboards … how do you make the difference? 2/ You say busbar is used for at least 25 years but when I visit other buildings I don’t see busbar. Why is not used more often in your opinion? How and when you use it would depend on what you wished to achieve. It is suitable for many, many applications from systems requiring 1000’s of Amps to small power and lighting. Ideally long straight runs are best suited to it, though not essential. You can have a large header busbar trunking (say 1000A) feeding smaller trunking (say 250A-400A), which in turn could feed still smaller trunking (say 16A)-100A). Some busbar trunking has additional conductors that can be used to control interfaces. There is no simple answer to this as how and what you use comes down to familiarity with the product and experience particularly on similar applications. If you are looking for a flexible installation that changes regularly with the addition of new equipment or relocating of existing it can pay dividends both in speed and cost. The installation itself can be much, much quicker than installing cables. Almost anything can be done, sometimes it requires some modification to manufactures standard equipment to achieve exactly what you want, however speaking from experience i can tell you that some of Telemacinuque’s now standard equipment came from modifications requested by a colleague over 20 years ago. Some busbar trunking is better than others, some is even IP Rate, the busbars being cast in resin. My advice would be to take on the services of a reputable building services consultant, one of the bigger names, I currently work for WYG (Formally White Young Green), others such as Hoare Lea, BDP will be able to provide a similar level of service. The best service will come from some one whom has actually designed schemes that use it, re inventing a wheel usually results in problems. If you require any pointers i will gladly advise you. my mobile number is 07775783663 if you should require to speak to some one. My colleague at WYG Manchester who is truly proficient with busbar systems is Mike Green, he is currently the technical director and can be contacted on 0161 872 3223. In my case IP will be IP54 but it is indoor installation. About supports I suppose you need also for cable to fix trays. For sure we will have provisions of junction boxes for extension, have you used busways for your own installation? do you recommend it? Some busbar trunking is better than others, some is even IP Amount, the busbars being throw in material. What you mean by better, for installation or usage? what are your advices? All busways I’ve seen have metal box with or without color, what solution do you suggest ? is all business man cheaters? Cheaters are people that are not doing nothing but want to take your money away,contractors on the other hand have to work hard and prove their work before they get payed. so don’t put every one in the same basket. It’s not fair to say contractors are cheaters, the problem is the accountants. They would want the bus solution at the cost of cable but install price of bus. Another problem is that the plant engineer may design to meet existing technology so if its been wired for 10 years and you start to add on do you bus or do you wire? Is it a development project and what happens when you decide that the project is no longer needed because we have a bigger idea (requiring bigger loads)?It is quite easy to run temporary installed cabling that could be hung later. also the problem is the design is not complete and no drawings available,still the contractor is requested to do programs and erect the plant without no proper information. I agreed too, while engineers design the job based on specs. and not price, accountant are not trianed to provide engineeering solutions but signs the cheque. I have experienced installing cables and busbars. The only thing I can say is that busbars in busways are not really flexible. When it comes to speed of installation, you will spend almost the same manhour installing busbar and installing cables. When it comes to safety, I would prefer cable to busbar. But it is up to you, if your business is getting commission for selling busway solution, then, you really have to believe that this is the best solution. Otherwise, you won’t be able to sell it. How and when you use it would rely on what you wanted to accomplish. It is appropriate for many, many programs from techniques demanding 1000′s of Amplifiers to little energy and lighting style. Sometimes it happens that when what we want If not got then we got anger and eratated about that matter. There are many situation faced by a human being that should be not happen and offcourse cheaters are everywhere in every field. Can we do a guest blog? I like this short article. Convergence of networks within Building: At last!